Taste of the Cuban Sandwich! 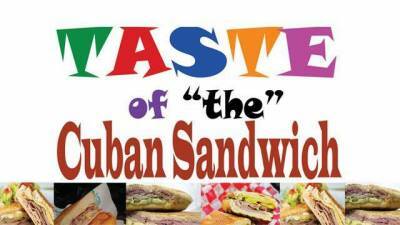 Taste of the Cuban Sandwich @ the Historic Centro Asturiano! Enjoy FULL DAY of community geared fun! Enjoy the most delicious Cuban Sandwiches from all over the world! Music provided by: Vaya DJ, Johnnie Rivera. Put your dancing shoes on and enjoy the exciting LIVE Music and Dance performances. Featuring the Kids Cuban Sandwich SHOWDOWN Junior Chefs of America, the Homestyle Contest AND The Biggest Cuban Sandwich in World. Goal for 2019 Tampa Sandwich is: 170 feet! Check out Dates for: Taste of the Cuban Sandwich!